This week on the Driving Law Podcast, I speak with the authors of the new impaired driving textbook, Impaired Driving and Other Criminal Code Driving Offences: A Practitioner's Handbook, Peter Keen and Karen Jokinen. We discuss some of the more nuanced aspects of C-46, including the rationale behind some of the major changes and the potential for constitutional challenge. It is a must-listen for impaired driving practitioners. If you listen to the end of the podcast, I will provide a discount code for you to get 10% off your own copy by ordering online at Emond Publishing. This week on Weird and Wacky Wednesdays, we look at what is possibly the best Florida story thus far, complete with an appearance by one of my favorite childhood cartoons. Then, we get a little bit into the Christmas spirit with a case involving a man in a chimney. Finally, we lose all Christmas spirit and hope for society over a couple of Oreo cookies. Follow the link to read on and find out about the weirdest legal cases I could stomach this week. This week on the Driving Law Podcast, I speak with Attorney General for British Columbia, David Eby, about how driving law has impacted his role as the Attorney General. We talk about the big changes to ICBC and what things will look like at the tribunal, how the insurance defence bar will be impacted, and what the future looks like for traffic court elimination legislation passed by the BC Liberal government. Finally, we delve into how high end cars and money laundering investigations are beginning to intersect. It is an important and fascinating discussion that you need to hear! 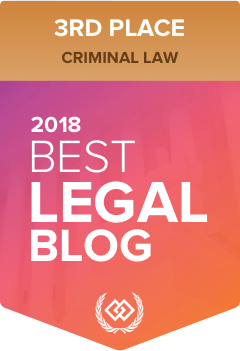 I am super pleased to announce that my blog won 3rd Place in the Criminal Law Category of The Expert Institute's Best Legal Blog contest. I work really hard to bring everyone quality content several days a week, and I am glad that hard work is being recognized here. Thank you to everyone who has supported me and my blog over the past few years. I will keep sharing my thoughts about new laws and regulations as they come, and bringing quality and informative content to this blog. One common concern that comes to mind each week when I read Weird and Wacky Wednesdays is why. Why would someone think climbing a tree would help them avoid the long arm of the law? Why would police officers from two separate precincts trying to arrest each other not realize they were all cops undercover? Why do so many of these stories originate from Florida? Well dear friends, this week you can add to that list, why would Kyla Lee invite me, Paul Doroshenko to write this week's episode of Weird and Wacky Wednesdays? The answer, however, is fairly simple. Kyla wanted to help me understand the "why." So here I am. Your guest blog posters, trying hard to understand the decisions made by humans. Let’s start with our first human in trouble, Mr. John Casford. This week on Weird and Wacky Wednesdays, we address three unusual cases. The first involves what was perhaps the humble beginnings of the greatest bowl of mashed potatoes of all time. The second involves what was perhaps the awful beginnings of the worst bowl of Rice Krispies of all time. And the third involves what was perhaps the humble beginnings of a beautiful and loving relationship. Oh, probably not. Tune in to find out why all of these are part of what is definitely not the worst week of Weird and Wacky Wednesdays of all time!